Any time you attend events on behalf of your business, banner displays can play a crucial part in making your brand stand out. But that is only true if they are designed and printed well enough to help rather than hurt your audience’s perception. How do you make sure that your retractable banner displays do the former, rather than the latter? It’s a matter of science. In all corners of marketing, you will hear talk about the importance of visual materials to support your brand. The reason for that is relatively simple: our brains process visual information 60,000 times faster than text, which is why 90 percent of the information committed to our memory is visual. As a result, brand recall greatly increases if the information is presented in a visual way. The right visuals draw your audience in, compelling them to learn more about your brand. Banner displays, which offer a large canvas to present visual information, are therefore ideal ways to attract your audience’s attention. A banner display—no matter how large or small—cannot solely rely on images to convey a message. You do need some text to communicate your message and persuade your audience, which brings up the next question: how do you find the right balance between image and text? Few studies have been done about the ideal image to text ratio for banner displays. But you cannot go wrong by following billboard-design best practices here. After all, both channels rely on catching their audience’s fleeting attention from a distance. Billboard designers try to keep their copy to six words or fewer, which is a good guideline to use for banner displays, as well. Stick to a single message, and communicate that message in one phrase. This is where the 80/20 rule applies: at least 80 percent of your banner should be visual rather than text. Many printing companies can help you find the ideal ratio. The design text itself also warrants consideration. You should use fonts that are easy to read, avoiding fancy alternatives at all costs. Keeping the copy short also means you can increase your font size, which will significantly help readability. Following best font-size practices for billboards can be a helpful start. You should always remember the fact that your audience will read your banner display top to bottom and left to right. That means your company logo should be at the top, while the important copy should be oriented toward the left of the design. We have written at length about the psychology of colors on this blog, and the same basic principles apply here. You should keep your color scheme consistent with your brand colors, which helps your audience quickly recall your brand if needed. But it does not hurt to add colors that aim to get attention. 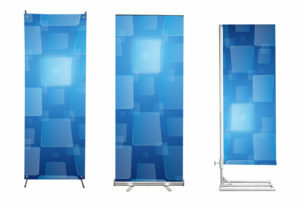 When designing roll-up banner displays, your color choices are almost endless. But once you boil down your choices to wanting to get attention and conveying your brand identity, the options become manageable. Check out this article on the most powerful colors to use to get your audience to notice you. Red is the best color to get that desired attention. But you need to be sure that its secondary connotations, ranging from intensity to power, do not contradict with your desired brand image. Despite your copy limitations, every banner should have a distinct call to action (CTA) that tells your audience about their next steps. This call to action can vary wildly; many businesses, for example, use their website as the primary call to action on their banners. But is that really the most effective CTA you could use? Think about it from your audience’s perspective: you are at a trade show, and walk past a booth with an attractive banner display. How likely are you to pull out your phone and type in the listed website? You probably have a higher chance of simply walking up to the booth if asked to or given the chance. Studies show, again and again, that simpler call to actions—no matter the medium—work better than more complicated asks. As a result, you may want to consider a simple “’talk to us” at the bottom of the banner if you choose to use your banner at a trade show. All of the above matter little if your roll-up banner is poorly produced. Whether the material is cheap and easily damaged, or your images do not look like they’re high-resolution enough to be included on a six-foot banner, a lack of quality can seriously hurt your goal of getting attention and at worst, it may hurt your brand’s reputation. That’s why when designing and printing banners, especially when printing in St. Louis, you should always consult with your local print shop to make sure that your new banner passes all quality checks. 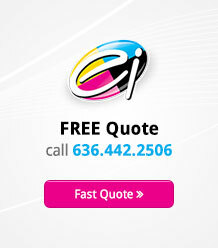 Your printer will help you make sure that your banner works in service of your brand. Roll-up banner displays can be a powerful marketing tool at events, whether you attend trade shows, conventions, community rallies, or fundraisers. Keeping the science of designing and printing these banners in mind at all times ensures that your money is well spent and that your banners help you get the attention that your brand deserves.